If you’re looking for luxury bell tent hire in Hampshire or surrounding areas for any sort of event – you’re absolutely in the right place. We supply cream bell tents across the South Coast and France for all events: Whether that’s weddings, festivals, corporate bookings, hen parties, birthdays, or anything else that might require accommodation. 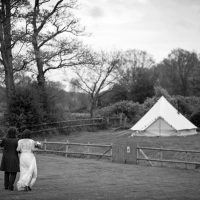 Our bell tents can be set up in fields, back gardens, campsites and wedding venues. We are fully mobile, meaning you just let us know where you’d like us to pitch! We also work with a jolly lovely campsite to provide a dedicated hen camp on the outskirts of the New Forest, which is set up from April – September. What we’re not: An actual campsite or bell tent retailer. We have over 80 bell tents in stock so we can cater for events of 6 tents or a lot more. We also cover France and the Isle of Wight – we’ve linked those 2 together because both involve a boat ride! We’re conviently located to Portsmouth so have access to both domestic and continental ferry terminals. We will travel further afield, but minimum order numbers may be higher. to discuss a bespoke quote. We understand you want peace of mind when booking suppliers for your event because there is no second chance if it isn’t right the first time. We’ve been providing luxury bell tents for nearly 6 years so we have lots of lovely client testimonials to the work we do. Most importantly we’ve had a LOT of practice! In that time we’ve grown organically through word of mouth, recommendation and repeat customers and we pride ourselves on being a small, family led business. Our staff are knowledgeable, professional and polite. They’re also strong! 6 years has given us plenty of time to tweak the way we work, and our offering, to ensure it’s practical, achievable and lovely. Because when you glamp with us it’s important you have an amazing weekend! Thank you Katrina for making Alex’s Hen night so special. It was a fantastic surprise for her. Your service was excellent and I would highly recommend you. The tent was really comfortable and beautiful and I cant wait to do it again. Thank you and your team so much for making Megan’s birthday so special. What a fantastic business you run. We couldn’t fault you guys at all. There are a few companies we looked at but you really gave it the personal touch with all the little extras you provided. The bunting, marsh mallows, the fire pit went down well too, keeping everyone warm till it was time to snuggle down in the comfy but luxurious bell tent. I have been inundated with email requests and have forwarded your details, so expect lots of bookings soon. Thank you again and I will contact you soon with dates for our next glamping experience. Back from an awesome hen weekend in the New Forest staying in two of your gorgeous bell tents – kitted out to perfection, decorated stunningly and comfy to boot! A thousand thank yous Beautiful Bells….we’ll be back for a reunion tour I think! 8 happy hens just back from a very special weekend of glamping in the New Forest. The bride to be was over the moon with the beautiful tents and all the thoughtful finishing touches. Even the non-campers amongst us were impressed by how comfortable they were. Katrina was attentive throughout and made the whole experience a real pleasure. I’m now just figuring out how soon I can find an excuse to book again. Thanks Katrina and Steve. We hired 6 bells including the wedding bell for our 'Westival' this August. The tents were stunning both inside and out and very decorative on the day. We put them on the lawn in front of the marquee so everyone could have a snoop and be jealous of the lucky few who got to sleep in them! � Katrina and her team were super helpful, friendly and efficient. Not only did the tents look great, but they were exceptionally comfy to sleep in. I couldn't have imagined waking up anywhere better than a bell tent with a view of the South Downs the morning after our wedding. Thank you Beautiful Bells!